In our last blog on Curb Appeal – Part 1: Fencing, Lighting, Landscaping and More – we reviewed how the appearance of your property can affect a current or potential customer – everything from the fencing to the storage doors. You know, the stuff that can make or break a first impression. In Part 2, let’s dig deeper and talk about your brand, property signage, how fresh messages and more can make all the difference. This is essentially the guts of marketing for self storage and it is more important now than it ever has been before. People are visual, they want to see pictures and videos and things that catch their attention right away. Otherwise, they quickly move on to the next thing. Are you catching their attention? The following tips can help you get their attention and to keep it over time. This one can be very simple or as detailed as you want to make it. The basis for branding is that it is recognizable. That doesn’t have to mean you are winning awards for the best logo or ad campaign. Essentially, it means that your brand needs to make a lasting impression and be a cohesive message across all platforms. Everything below is part of your brand, so it needs to be strong and memorable and in the forefront of every marketing decision you make. Trust me, it is not an afterthought. Let’s break this down into the most important segments to make it easy. Think of Branding as the umbrella, and these are some of the spokes that keep it open and working. Do you have one? Or better yet, do you have a good one? That doesn’t mean it has to be a professional illustration or something you paid thousands of dollars to have designed. A good Logo is one that is recognized and remembered, one that fits your business and one that fits your personality. It can be as simple as just your store name using the text as the graphic, or it can be as elaborate as having a trademarked character to represent your store. The bottom line is that it needs to be easy to see and read from a distance, but also hold up when reduced down to a business card or smaller size. It needs to be versatile. It should work when printed in full color, one color, grayscale or black and white. These examples are for Moove In Self Storage and 140 Mini Storage, showing the difference between a simple text logo and one with a trademarked character. We are going to continue using Moove In Self Storage as the example, to help show you how everything is Branded the same across all platforms in their marketing for self storage. Do you have Signage at your entrance? OK, since that is a no brainer and 99% of you answered yes to this one (at least I hope you did), let’s go beyond actually having a sign. However, if you don’t have one you need to get one! Is your signage in good repair? Is it clean? Is it lit at night? Is your Logo on it? These are very basic questions, but I am often surprised when I drive by a facility and see a main sign in bad shape. Don’t be one of those people who, when the lightbulbs burn out, waits two years to replace them because it just didn’t seem important to you at the time. It is important! Your Signage is typically the first place a customer will see your Logo and be exposed to your Brand – and it may even be the first thing they see as they drive by your store. Clearly your sign is a big part of your curb appeal. It should be clean; the poles should have a fresh coat of paint; the lightbulbs need to work; it should be free of dents, cracks, major scratches and any noticeable damage; it should be standing straight, landscaping around the base should look professional and be free of weeds…basically your sign should look almost new at all times. I know a lot of townships have strict signage regulations, but do what you can within those parameters, and your sign can be very impressive. Let’s look at the main entrance Signage for two locations of Moove In Self Storage. The sign on the left was more creative, using a masonry base with silos and be fairly large overall; whereas the sign on the right was restricted to a simple pole sign and had to be much smaller. Both signs are branded the same and are easily recognizable as the same company, regardless of the township regulations and the fact that the two signs are completely different in size, design and materials. If you are unsure of how to improve your current Signage or get a new one, check with your local sign company. They can be a valuable resource because they know the regulations in the area townships and can give you options to fit your budget. Most times they can do all the work as well, whether or not you are fixing or replacing your sign. FRESH MARKETING FOR SELF STORAGE. If you do any marketing at all (and by George, you better be doing some), your messages are key to supporting your Brand and should be reflected in your property Signage, and simply must include your Logo. (Do you see how it all ties together?) You don’t have to be a marketing genius to have good, fresh messages. Starting at the smallest amount of effort, have somewhere near your entrance or main Sign where you can display messages regularly, and change them often. For example, a digital reader board as part of your main sign or a simple sandwich board that you place at your entrance is all you really need. • If you and your store are a more “no nonsense” type of personality and you prefer a black and white type of style, you can be short and to the point. Example: Rent a Unit This Week and Receive Second Month Free. • On the other hand, if you are more laid back and like to have fun with your marketing and your brand lends to it, you can get more creative with your messages. Example: Bring Your Stuff Here. We’ll Hang on to for Free Next Month! A reader or sandwich board allows you to easily change Marketing Messages to fit the changing seasons, highlight new specials you are offering, or even to wish the local high school sports team good luck in the big game. If you have one of these or are planning to use one, be sure to create a schedule (you can have your property manager help you) of your messages ahead of time, then stick to it. That way it will be easier to follow and less work in the long run. If you are willing to spend more time and invest some dollars, you can go all out and display Branded Marketing Messages throughout your store and property. When you really think about it, everything on your property is part of your overall Marketing Message – from the pavement to the roofs and everything in between. This includes posters on the rental office walls and the actual retail items to employee shirts and Signs on the fence and gate to Signs on your building doors and so on. Here we have Branded retail items and coordinating Signage for Moove In Self Storage. Again, the same theme remains with the red, black and white color scheme, cow spots, the same font and the Logo. If you choose to display posters at your facility, plan to swap them out occasionally to keep things fresh. To be cost effective, you can purchase frames up front with a clear plastic front (avoid glass, it can scratch and break) so you can simply replace the printed poster as needed and the frames can stay put and last for years. You should consider changing your posters out every year or two to a new design or message. You can keep the old ones and swap them back and forth if you want as well. Again, this will keep your Marketing Messages fresh for new and existing customers. 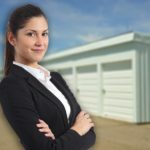 DIGITAL MARKETING FOR SELF STORAGE. Yes, this is in fact Curb Appeal! (Though not in the traditional sense.) Think about your kids or grandkids for a minute…do they even know what the yellow pages are or how to get from one place to another in a car without help? The younger generations coming up have most likely spent little or none of their lives without computers, cell phones, tablets and GPS. And gone are the days of phone calls and in-person meetings because texting, email and skype have taken over. Your Brand and Logo need to be out there in the digital world as your digital curb appeal. That means a user-friendly website, preferably one that offers reservations (and perhaps rentals) online. You also need to be on social media, specifically Facebook, Twitter and Google+. That means not just having pages set up, but also posting to them at least twice per month, or once per week if you are more ambitious. Again, your Brand and Marketing for self storage need to be consistent in the digital arena as well. Whatever style you are using at your physical store should be replicated in your digital “stores”. Keep the colors the same or as similar as you can get them, make sure your Logo is everywhere, and keep the same personality in your Marketing Messages. Now let’s take a look at the Moove In Self Storage website – it’s pretty clear that it matches the Logo, Signage and other Branded items. I’m sure you realize that 20 and 30 somethings spend most of their time glued to their smartphones, so you need to be where they are. Many of those individuals prefer little to no face-to-face interaction. They would rather search your website or social media pages to find the info they seek instead of calling your store to ask. And they wouldn’t dare stop in to meet you! OK, that may be a bit dramatic, but it’s also the truth. As the population ages, the digital world becomes more and more important. If you don’t have a digital presence, you are losing out on a lot of potential customers. The key to your Brand remaining strong and growing over time is to have it the same in everything you market. Curb Appeal doesn’t just literally mean your curb or building anymore. • Branding is very important and should be recognizable. • The Logo for your store needs to be memorable and easy to see and read. • Your Signage should be Branded and in good repair at all times. • Marketing Messages should be consistent and support your Brand. • Digital Marketing isn’t going away. If you aren’t there, get there now. This information is just the beginning of the many ways you can improve your Marketing efforts. These items, however, are the vital ones and they are necessary to improve the overall Curb Appeal of your store. If you have any questions on improving your marketing efforts, contact us today and our team can help. Jess holds a leadership position for the Investment Real Estate Group of Companies (IREGC), where she plays a vital role in strategic planning, accountability and setting goals for the company. She began with the company in early 2013 and leads the marketing efforts for IREGC, which includes the self storage facilities managed by Investment Real Estate Management (IREM). She has been essential in advancing company-wide marketing efforts, specifically in the digital arena. She is responsible for developing and leading graphic design and marketing initiatives, creating and managing the marketing budget for the companies, and supervising and mentoring Kassandra Mejias, Graphic Designer for IREGC. Traditional marketing efforts are reinforced with strong branding and design, print media, photography and videography; while digital marketing efforts are accomplished through social media, email campaigns, blogging, SEO and website design and management, among others.